By our very own Spirit Box VIP Ambassador, Dana Burkey, this series is a must have for cheerleaders worldwide. We have limited copies available and can include them in your December Box or ship separately. Max Turner is a tom boy through and through. Her favorite activities include hunting, fishing, playing sports, and running around with her neighbors Peter and Kyle. But, when Max meets some girls doing flips and tricks at the local trampoline park she gets introduced to a whole new world. With her dad's encouragement Max finds herself in a place she never imagined she would be: an all star cheerleading gym. 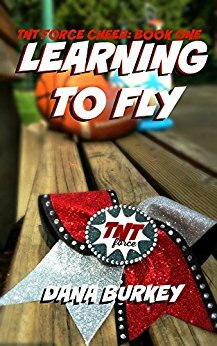 TNT Force is one of the best cheerleading gyms in North Texas, and between the glitter, massive hair bows, and over the top dance moves Max is sure she has no place in the gym. But, as she soon learns, she has skills that even top cheerleaders and gymnasts work years to develop. Will Max tough it out and give cheerleading a chance, or will she ignore her natural talent to stay in her comfort zone?